A few weeks ago a friend of mine asked if I could ice and decorate a fruit cake she had made for her parents 50th wedding anniversary. 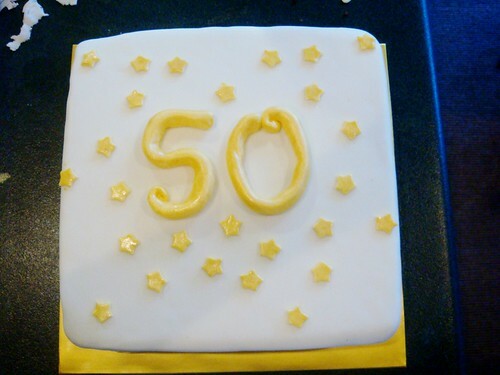 It was just a plain square cake to be covered in white fondant with gold stars and a gold 50 to go on top as well as gold stars on wires to stick in at the party. I told her of course I could, then got talking about the party, her parents and the cake which lead to a conversation about making ANOTHER cake for the anniversary. I already had two cakes on that week to do so it wouldn't have been possible for me to make an edible cake but I did have some cake dummies lying around that I used for the Grace Cake. 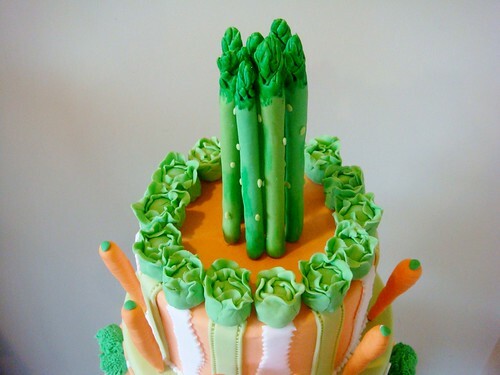 So we decided that I would make a three tier display cake and it would be themed around raw food. 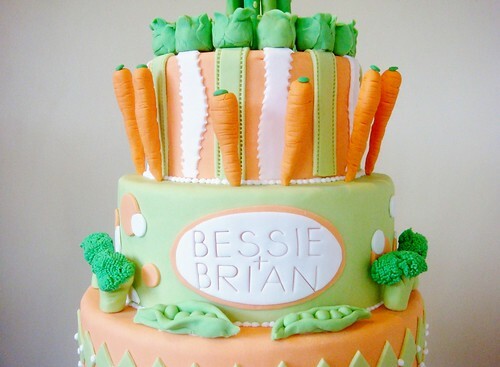 Apparently the couple LOVE raw fruit and vegetables and they are very well known for this. The baby peas were as easy to make as they look. 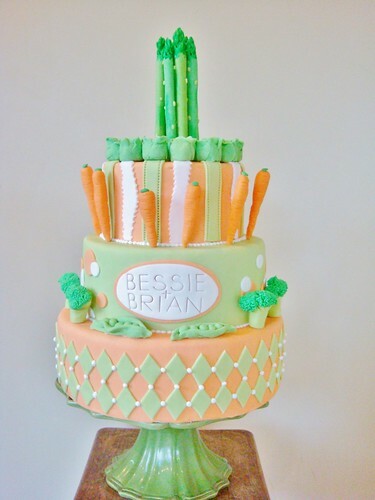 All you do is roll five small balls of green fondant then cut out two strips of fondant and wrap them around. You can play with it to make it look however you like, then pinch the ends. I made the asparagus by rolling out green fondant like a sausage, then sticking a bamboo skewer in the middle (so it would stay up right). I then used scissors and cut slits out of the top to give it that asparagus-y look. To make it look a bit more realistic, I put tiny little spots of light green fondant on the sides then roughly painted the stems and tops with green food colouring. The lettuce was pretty easy to make once I got the hang of it. I rolled a small ball of green fondant then cut out about eight circles of the same size and stuck them around the ball, alternating the starting points. I ruffled the edges with my fingers to give it a lettuce-y look! 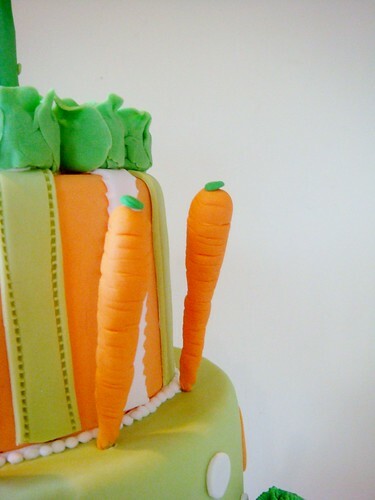 The carrots were the easiest to make, all you do it roll some orange fondant like a sausage but make one end thin (I put a toothpick down the middle to make them stand easier) then just cut marks on the side with a knife and pop a bit of green fondant on top! 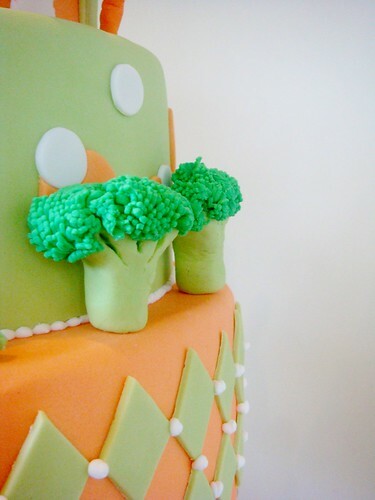 The broccoli was my favourite to make. I used two different shades of green, one for the stem and one for the top. I made little tree type figures from the light green fondant then put the dark green fondant through a sieve (you can add some shortening to your fondant to make this easier) and stuck that on top, easy as that! 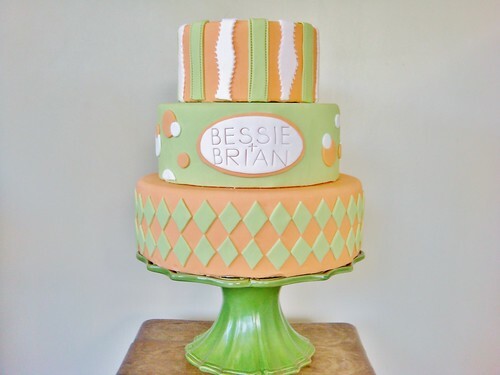 Bessie & Brian's 50th Anniversary Cake! 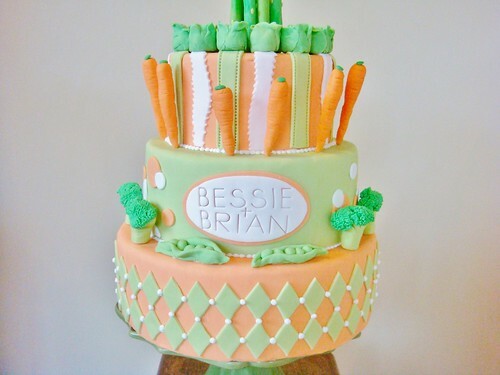 I really liked this fun design, it was so cool to make something that is supposed to be healthy out of icing! I heard that the couple LOVED their display cake (and the edible one) and they'll be keeping it to remember their special occasion. Awh, I love happy endings! Yes of course! Thank you for asking first!